Browning's Blackout features a Dual Fuel design that uses either a USB rechargeable 16340 Li-ion battery or a disposable CR123A battery, with high/medium/low modes, is fully waterproof and features compact aluminum body construction. Browning &apos;s Blackout features a Dual Fuel design that uses either a USB rechargeable 16340 Li-ion battery or a disposable CR123A battery, with high/medium/low modes, is fully waterproof and features compact aluminum body construction. Light up the night or give off just enough light to find your spare magazine, without spooking wildlife in your immediate vicinity. 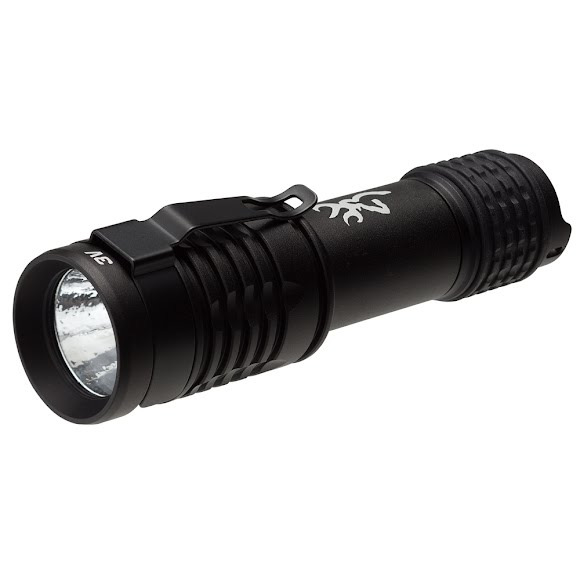 The Blackout 3V USB Rechargeable Flashlight will earn a place in your glove box, gear bag, or pocket, it&apos;s that good. In the past, lights using rechargeable batteries required specialized and often bulky chargers and cables. USB Charge capability allows you to use standard Micro USB cables to plug into the light directly or even directly into the battery to quickly top off your charge with home and car cables/charges that you already have on hand. Rechargeable batteries save money and are capable of higher light output, but are susceptible to power drain while not in use and are not always practical for use in the field. Dual Fuel is a design concept that allows lights to run off of rechargeable or standard disposable batteries, increasing the capability of your lights and giving you the best of both worlds.